The Vernamfield aerodrome in South West Clarendon symbolically received its first aircraft last Monday when a helicopter with a team led by international business mogul, Michael Lee-Chin, Chairman of Jamaica’s Economic Growth Council, landed at the former US Air Force base for a tour and fact-finding mission in support of the ongoing development of the facility into a global air cargo transfer hub. Along with Lee-Chin and the Deputy Chairman of the Economic Growth Council, Senator Aubyn Hill, the visit included Industry, Commerce, Agriculture and Fisheries Minister, Audley Shaw; Minister without Portfolio in the Office of the Prime Minister (OPM), with responsibility for the Vernamfield development, Mike Henry; and a broad group of other stakeholders, including from the growth council and the Airports Authority of Jamaica (AAJ); and Member of Parliament for South West Clarendon, Noel Arscott. Amid dialogue and ground and aerial tours of the ongoing development, Lee-Chin requested a basic outline of what is needed to get the initial phase of the development fully off in the shortest time; what policy direction was behind the initiative; and what was the status of private interests in collaborating with the Government to build out the very ambitious and multi-faceted project. 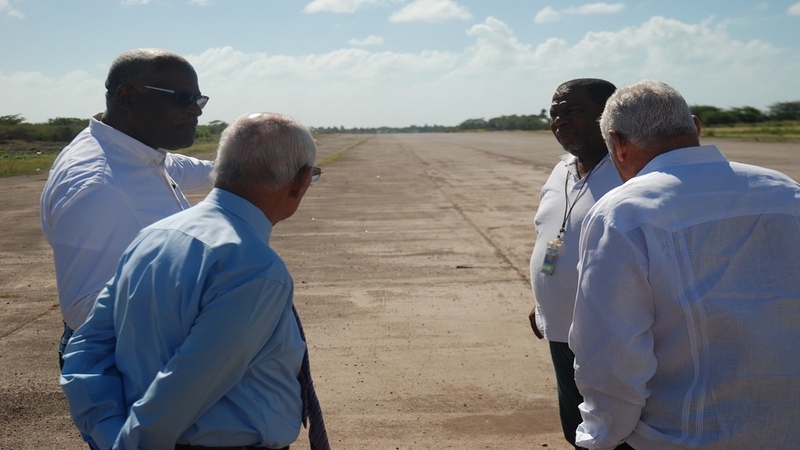 In response, Minister Henry and Project Director, Lt Col Oscar Derby, indicated that while preliminary works, including limited focus on the sides of the main existing runway at the aerodrome, are well under way, the overall costing to fully rehabilitate and gradually extend the runway and establish the necessary supporting infrastructure are still being determined, following which the details are to be included in a submission to Cabinet to seek approval for the major infrastructural aspects of the development. 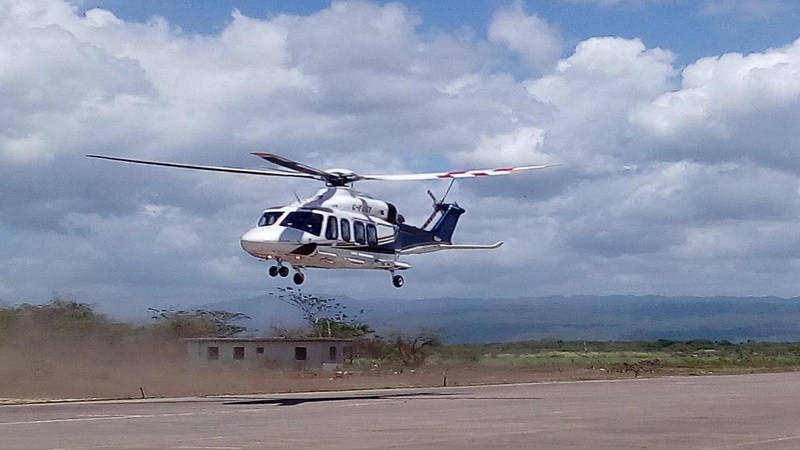 FIRST LANDING: A helicopter with a team of officials, including Chairman of the Government's Economic Growth Council, Michael Lee Chin, arrives for a tour of the Vernamfield development site in South West Clarendon last Monday. Derby indicated that already the main runway and the immediate outer areas have been fully cleared of vegetation, and a construction team is now doing grading and compacting work to the sides of the current runway. He noted, however, that the integrity of the runway was compromised in places over the years, and “it appears that it was never contemplated to use the runway again”. Derby cited, for example, the laying of water mains across the runway pavement, which will have to be removed and rerouted, and the integrity of the pavement restored. Going forward, additional lands need to be acquired to facilitate the project, a process that is already well under way in terms of the necessary consultations prior to the expected overall acquisition. Derby said the focus is to first restore the 6,500 feet runway, then to construct a parallel runway of 14,000 feet to accommodate the largest and heaviest aircraft in operation, including the Antonov 225, the world’s largest cargo plane. 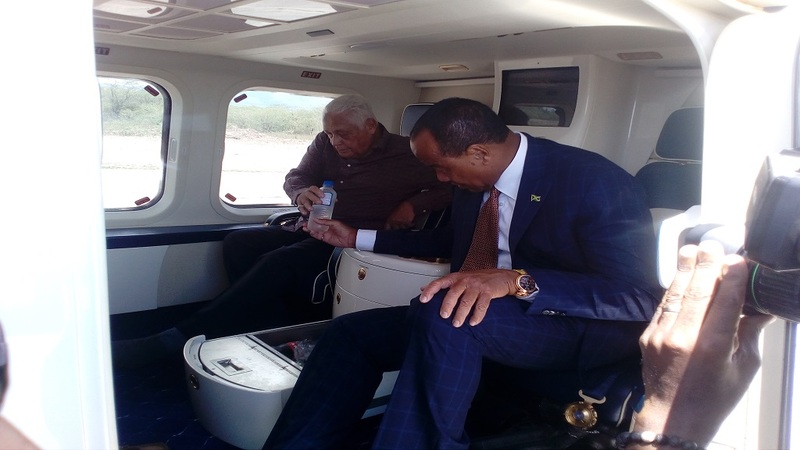 Mike Henry and Michael Lee-Chin on board a helicopter tour of the Vernamfield development in South West Clarendon last Monday. 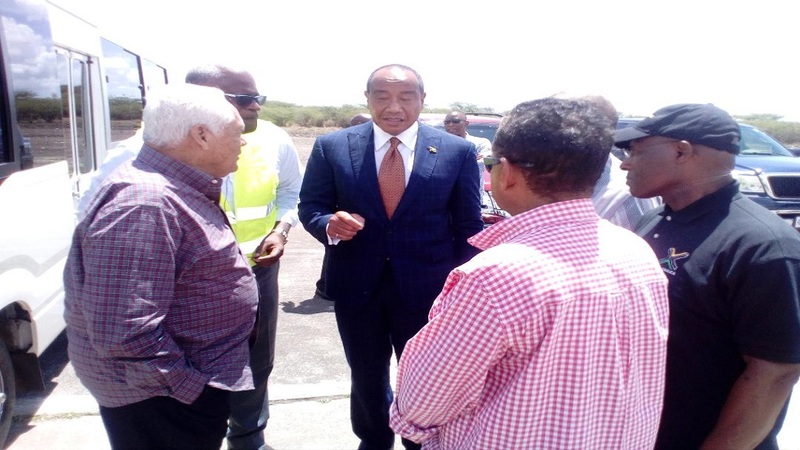 In response to Lee-Chin queries on timelines, Derby said some aspects of the development could get under way within six months after Cabinet approval is secured. 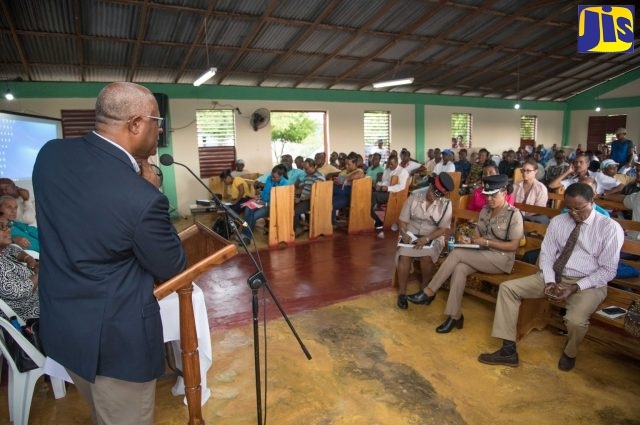 The early start-up aspects of the development, he said, include flight training; aircraft maintenance, repair and overhaul (MRO); drone manufacturing; a central campus for the Caribbean Maritime University (CMU); and the accommodation of aspects of the Jamaica Defence Force’s (JDF) operations. Henry indicated that there is no plan to disturb the nearby Garvey Maceo High School, but instead, to foster the gradual development of the school into a more technically-oriented institution along the lines of the CMU in Eastern Kingston, to fit seamlessly into the big development on its doorsteps. In a technical presentation, Derby outlined the long-term development plans for ‘Aerotropolis Jamaica’. This includes the facility offering break-bulk, light manufacturing/assembly and logistics services, with businesses connecting to over 150 countries in Asia, the Americas, Western Europe and Africa. Notably, Jamaica has been cited as the closest island state before entering and after exiting the northern end of the Panama Canal, with ships traversing the canal passing within close proximity to Jamaica and its sheltered harbour port in Kingston. Jamaica also offers the opportunity for break-bulk and value-added logistics services with time-sensitive goods in transit being shipped onwards by air. In noting that a the vast majority of goods entering the Port of Kingston is being transhipped to other destinations, with the smaller percentage intended for Jamaica itself, Derby said Vernamfield, with its 14,000-foot runway and its modern cargo logistics facilities, is projected to offer a similar hub for goods in transit, as well as the opportunity for the shipment of non-traditional exports to a market of 1.6 billion within 10-hour flights, and to the global markets of Africa, Asia, and the Middle East within 18-hour flights utilising the largest and heaviest cargo planes in operation…, all this from an airport which is at an elevation well above the effects of sea level rise over the next century and beyond.